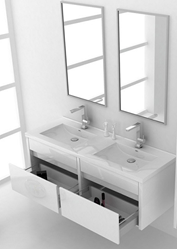 Novelli Luxurious WHITE Double Bathroom Cabinet / Vanity with 2 doors and 2 drawers, Ref KC138O. Size:1380 mm L x 475 mm D x 590 mm H In brilliant white gloss paint, walnut / oak/black finish. Optional Tall cabinet( wall), mixers and Mirrors. A great ensemble for those with room to spare but not without limitations on measurements. Ideal for anyone looking for a winning combination of style, sleek design, and size that brings it all together to present something dashingly urban. The 2 drawers and 2 doors feature Blum soft close drawer sliders and hinges ensuring they close silently and effortlessly every time. Highly Durable Acrylic-Resin countertop has Integrated Rectangular Overflows. This wall hung unit has been designed to be installed very easily. It comes supplied with wall brackets to be fixed to your wall and thereafter you hang the unit onto the brackets using the brackets which are fitted to the cabinet. Fully assembled and well packaged to avoid any damage in transit. Note. Price excludes the mixers, basin wastes, mirrors, side cabinet. Same style model is also available in 395 mm L, 600 and 900 mm L in all above colours. Matching tall cabinets, mirrors and mirror cabinets are available.